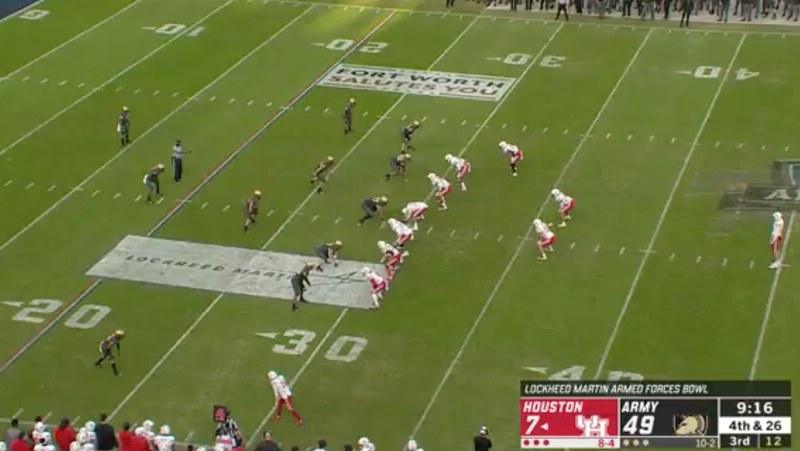 The Houston Cougars were thoroughly spanked by the Army Black Knights in the Armed Forces Bowl. While some coaches would want their players to play hard through the final whistle of the game—despite being down well over 40 points—Houston coach Major Applewhite raised the white flag early in the second half. Houston followed up the first five plays of a third-quarter drive that took the team 51 yards down the field with the following three plays: a 10-yard loss, a six-yard loss on a sack and an incomplete pass. Rather than send out a field goal unit, or even try to go for the first, Applewhite called his on his team to punt the ball away from Army’s 30 yard line. Houston downed the ball on Army’s four yard line and proceeded to return all the punt yardage back to the Black Knights on the following play because of a 15-yard personal foul. On the one hand, the decision kind of makes sense. Why waste the effort during a game you have no chance of winning and risk a potential long-term injury to a player? Still, the fact that this decision came from Applewhite is kind of laughable. Earlier this season, he got into it with star defensive tackle Ed Oliver because he was wearing a coat reserved for players who actually suited up for the game—which Oliver had not. A coach who does that kind of thing definitely has a hard-lined code over the right and wrong way to approach football. If I had to guess, throwing in the towel with almost an entire half of a game left probably doesn’t fall in line with Applewhite’s creed. Oliver surely understands this and is likely laughing at the result while wearing a coat of his own personal choosing.